Maya Professional Blogger Premium Template 2018 - A High Quality and Responsive Blog Style Blogger Template by Maya Gaurab Design. In this session we are sharing blog blogger template in another professional blog. Fully customizable search engine for this blogspot forum and pure responsive responsive blogger template. Minimal and creative blogger templates with this abundant features You can change template fonts and colors with one click of the Blogger Template Designer. Maya is almost like a spool if you are running a blog with a blogspot, Maya will be the perfect template for your blog. This is a high quality and professional blogger template for blogs with some features, this wonderful template is free and if you want to get the complete features of Maya , You should buy a full version template. 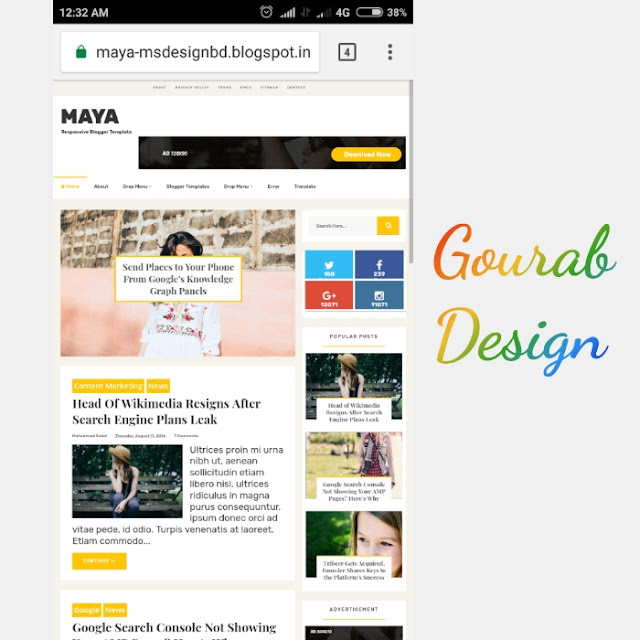 Please Note: This Premium Template its free only on my site Gourab design.So download now.